A decent movie because of its humor, atmosphere, and somewhat quick pace, but the problem here is that everything feels familiar and like something we’ve seen it before, again and again. Not one of Woody Allen’s more creative films, this one gets the atmosphere and social context down, and has a pretty good first half, but after that the movie just completely loses its focus. It tries to tell two different stories, separating the two halves of the film with the main character, Bobby (Jessie Eisenberg,) in California for the first half and then in New York for the second. The California story involves secrets, deception, and a powerful romance. The New York story involves none of these. What basically happens here is the California story is a movie unto itself, and the New York story is just a sort of epilogue. The story gets so far removed from what potential it had going for it, that a whole new subplot is invented in the later portions of the movie, involving characters who are just then being introduced, (Bobby’s sister,) and not featuring our protagonists at all. When you have to do that, and do it towards the end of the movie, you know something is wrong. 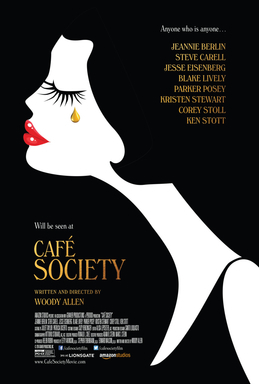 Cafe Society is a Woody Allen movie, and it is probably one of the least creative of the director’s films. It’s not a bad movie, but there’s just nothing special about it at all. In the past decade, Allen has had a sort of second coming to his career. He stopped making movies that were strictly slapstick and began getting more artistic, taking on more serious films. Allen started setting these movies in European countries, during different time periods, and even making some movies that weren’t comedies at all (Match Point, Cassandra’s Dream.) He combined the time period and foreign country situation together to make his most successful film during that decade, Midnight in Paris. He then did it again with From Rome, With Love. With his latest movie, Cafe Society, Allen delivers on the time period, setting his movie in the 1930s, but other than that, this movie is pretty simple-minded and straight forward. For a director that usually branches out, this one is more of the usual kind of thing that could have been made by anybody. Even the main character, Bobby Dorfman, (Jessie Eisenberg,) is played by an actor who has been Allen’s lead before, channeling the movie director’s persona the same way that the protagonist of nearly every one of his films does. Eisenberg did it better in From Rome With Love. Cafe Society is about the kid going out to Hollywood to work for his uncle, and then coming back to New York to work for his brother. The movie is literally told in two halves, with each half taking place on a different coast of the country. Luckily, it doesn’t quite have two stories, and instead carries the story of a romance formed in the first half, over into the second half. Only it’s not the same. In the first half of the movie, that romance took center stage and was complete with secrets and complications. In the second half of the film it is an afterthought to everything else happening, and that’s a shame, because it leads to the movie pretty much falling apart. At the start of the film, Bobby goes out to California to work for his Uncle, Phil. (Steve Carell.) Phil is a big time Hollywood agent who has no time for Bobby, and lets the kid wait a week, before actually sitting down for a face to face with him. Once he does, however, Phil takes an immediate liking to the kid and asks his secretary, Vonnie (Kristin Stewart,) to show his nephew around town. Bobby falls pretty hard for Vonnie, only she has a boyfriend and rebuffs his advances. Then we learn the secret. It’s only about a quarter of the way into the movie, so hardly a spoiler, but let’s just say Vonnie’s “boyfriend” is a married man, who Bobby knows. The married man refuses to leave his wife, and breaks up with Vonnie instead, freeing her up to start dating Bobby. And she does. Until one day when the secrets all come out, and not only does Bobby learn the identity of the man she was seeing, but that man also learns about Bobby. This is all interesting stuff. It is far more compelling than anything that happens in the second half of the movie, and that’s a real shame. In the second half, Bobby leaves California, and leaves Vonnie in the arms of the other man, who has officially agreed to part with his wife for her. Bobby returns to New York to work for his brother, Ben (Corey Stoll.) Ben is a gangster and with Bobby’s help, he opens up a night club. Throughout the movie so far, there has been one running joke with Ben, which is that whenever he says he’s going to talk to a guy, we get a quick flash to what that really means, which is that he’s going to have the guy either beat up or killed. Considering that Bobby is now working for a gangster, you would think the second half would be a lot more interesting than it actually is. All that really happens during this time is that Bobby meets a girl at the bar, named Veronica (Blake Lively,) and starts dating her. Soon she becomes his wife. Then one day Vonnie comes to New York with the man she was seeing, who is now her husband. She sneaks away for a night to spend it with Bobby, this time with him showing her around, the same way that she once did for him. And this is pretty much where the story between them ends. It’s too bad, because this story had so much promise earlier on in the movie, only ton fizzle out in the second half. There’s another storyline that comes up here, in the second half of the movie, and it is totally unrelated to anything in the central line, that it almost feels tacked on. It involves Bobby and Ben’s sister, who has a nasty neighbor that disrespects both her and her husband. The sister tells Ben about it and asks him to do something to put a scare into the neighbor. Ben does more than that, and it becomes a guilty conscience situation for both the sister and her husband. This storyline is interesting, but it also feels completely out of place. Consider that neither Bobby nor Vonnie is in this story, and that the character who it is centered on, (the sister,) was barely a part of the film up until now. There are definitely things that work about this movie. The time period and way that the film serves as a love letter to old Hollywood are great. Really the whole California storyline is well-done. The movie lacks Allen’s usual humor, but that’s okay, because the director has proven that he can make great movies which aren’t very funny at all. Only those movies tend to be especially creative. This one is not. It’s about a love triangle and the way that two of the characters involved don’t know about the other one, and are basically tip toeing around it without even realizing what’s happening. So the two men in Vonnie’s life are literally having conversations about her and about another man that she is seeing, without ever realizing that this man is the person they are talking to. This is pretty witty. The problem is that it all dies away in the second half. It’s like the movie wants to lose it’s plot and become something else, and doesn’t realize that in doing that, it ends up throwing away everything that was working so well. Now there are call backs to that romance, when Vonnie comes to visit New York, but it’s hardly the same. There are no new secrets or discoveries here. Instead, it’s like the first half is an entire movie unto itself, and then the second half is just the leftover scraps stuffed into an epilogue. The movie works for a number of reasons, including the atmosphere, time period, and likable cast. But in terms of plot, it had something going and then kind of threw it all away. What a shame.